Creating new pages may be the single most performed action you will make on your site. This page will serve as a quick guide to creating pages, using a blog site as an example. 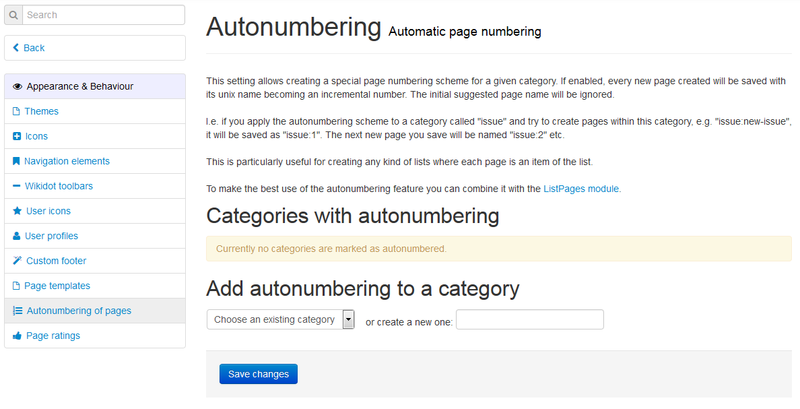 Important topics include categories, the NewPage module, and autonumbering. Every page on your site has a page title (even if that title is blank), but they also have page names, which can never be blank. The page name is what is used in the URL of the page. For example, the page name of this page is "help:creating-pages". The category of this page would be "help", since it precedes the colon. Note: If you have an uncategorized page and would like to add a category to it, simply rename the page (one of the page options at the bottom) and add the category to the beginning of the page name already there. Be sure that there is a colon (:) between the category name and the page name itself! Categorizing pages like this allow you to do a variety of things. For example, you can now list only the "blog" pages using a ListPages module. In the Site Manager, you can set the edit/view permissions of specific categories. For example, in the Site Manager, you could set a "hidden" category to be private. Perhaps most importantly, however, is the ability to template different categories. Because of these advantages, we generally recommend that you put your pages into categories whenever possible. In the page creator form in the side bar, you can give a page a category by proceeding the page's title with the category name followed by a colon. This is just a small overview of categories and their importance. For a more in-depth explanation, see the Community How-Tos. This site comes with a form on the sidebar that allows you to easily create new pages. These pages will be initially uncategorized unless you provide a category name in the text box (by typing the category name followed by a colon). Let us say that you are working on a blog on which weekly posts will be made. If we use the scheme above, you may find it to be somewhat annoying to have to type out "blog:TITLE" every time you want to make a new post. Thankfully, Wikidot provides you with a tool that allows you to easily make pages: the NewPage Module. In fact, the form used on the side bar is itself a generic NewPage Module! Now, every time you use that form for creating a new page, it will automatically add your post into the "blog" category. There are many more options native to the module for you to try out. For more info, read Wikidot's Documentation. Now, let's say that you are a very active blogger or are running a collaborative site on which multiple people may be posting at a time. You might find yourself running into a page name collision problem. No two pages can have the exact same page name (category included). If a user attempts to create a page that already exists, a new page will not be created! In order to avoid this problem, Wikidot offers the ability to autonumber page names. For a given category, Wikidot will automatically assign a page name for each newly created page, and since the process is automatic, running into a page name collision is effectively impossible. Look for one of the last options called "Autonumbering of pages". Click on the "+ Add autonumbering" button. Choose a category for which to add autonumbering. After that, you're done! Be sure to explore the Options as well for more customization.